I have problems with discipline and regularity. For me it is hard to keep doing something in the long term. Accidentally I found in youtube some guys completed 100 pushups challenge. You need to do 100 pushups every day for 30 days. How many sets is doesn’t matter you can do like 30–20–20–15–10–5. I liked the clearness of the goal and all you need is a floor, no gym or extra equipment. So 23d of October I decided to make 100 Push-ups Challenge. It was more for self discipline than for muscles or abs. Also I decided to do it in public and track all my results everyday on my website. I can see there what is the current progress and how many pushups are left to do. I’ve done these push-ups everywhere: in my room, in co-working spaces, cafes, one time I even done it in a airport. It wasn’t comfortable but didn’t want to lose my challenge just because I was in a public place. It was a bit hard physically, because your muscles do not have time to rest. But to be honest it was more difficult mentally to keep doing it everyday. Sometimes I was lazy, sometimes there was pain in the muscles, of course. Yesterday I have completed this challenge. One month seems like long time if think from today but it will go fast and we will regret that we didn’t do anything. 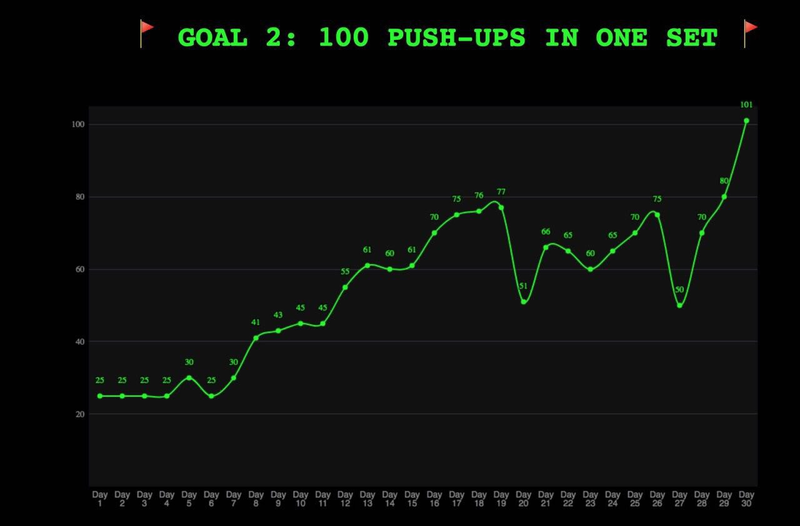 And as a second extra goal I wanted to make 100 push-ups in one set! This was really hard! I almost gave up! But I believe that maybe I still could do it! And I keep trying and reached a success! 💪💪💪 I’ve done 101 pushups in one set! Another thing that helped me this month was Lift or Die group. It was good motivation from guys like me who are doing sports every day. Setup an inspiring clear goal. Realistic but hard enough. Be with people who also challenge themselves. You almost don’t need coding skills all you need is a site and Google Sheets. All data will be updated from Google Sheet automatically. If you have any issues with setup, let me know and I will help you. Want to see if I reach my goal?